The search engine at Ask.com has been around for a long time in internet years, more than a decade according to its initial public offering of stock. Our mission is to humanize the Internet by making it easier and more intuitive for consumers to find the information, products and services they need, and for companies to better acquire, retain and maximize the value of their online customers. Our branding strategy centers on the Jeeves character, a friendly and trusted assistant who provides help and guidance on the Web. The Ask Jeeves question answering services allow users ask a question in plain English and receive a response pointing the user to relevant Internet destinations that provide the answers. We believe that our question answering services make interaction with the Internet more intuitive, less frustrating and significantly more productive. In 2006, the search engine retired Jeeves, with a stated focus of making search more usable and more innovative. I was personally sad to see Jeeve’s leave the search engine, and I suspect that the rebranding of Ask.com was a difficult choice to make. Ask.com has been working hard since then at making itself a more useful resource for timely news information, and has started incorporating multimedia into that mix. The questions and answers that were so well known as an askjeeves.com feature are still there, but the search engine hasn’t stood still. For example, a search for Bruce Springsteen is presently showing a rich mix of images, scheduled events, web pages, and news results for the performer, and if you hover your mouse over the image next to the news results for Bruce Springsteen at Ask.com, the news video starts playing. Systems and methods for presenting information are disclosed. Users are presented with a selectable representation of the information on a webpage. Users can access additional information and/or another web page by mousing over the selectable representation. The mouse over includes pointing the mouse pointer over the selectable representation for a predetermined amount of time. Systems and methods for clustering news information are disclosed. The news information is clustered to form clusters to include one or more of articles, blogs, images, videos and the like. The news information is organized according to topic and/or temporal information. The clustered news information can be presented to a user who can browse or search the clustered news information. Systems and methods for presenting news information and personalizing presentation of news information are disclosed. Users are presented with a selectable, visual representation of the news information. Users can access additional news information and/or a personalized newspaper by selecting a visual representation of the news information. Systems and methods for monitoring user selection and modifying the personalized newspaper are also disclosed. Systems and methods for organizing related news information is disclosed herein. The systems and methods include clustering a stream of news information according to the topic of each news information and according to temporal information of the news information. Systems and methods for presenting information to users are also disclosed herein. The systems and methods include receiving a search for news information from a user and presenting the news information according to the topic of the news information and the temporal information. A method and a system to receive temporal content from many sources over a transmission line, store the temporal content in at least one storage device, extract entity content from the temporal content, analyze entity occurrences to determine temporal content trends, receive a search query from a user, and render personalized temporal content to the user based on the temporal content trends. A method and system to preview video content. The system includes a loader to present one or more objects associated with video content, responsive to a search request; a trigger to detect a pointer positioned over a first object from the one or more objects; and a mode selector to provide the first object in a preview mode. A method and system to provide targeted advertisements with video search results is provided. The system comprises a query component to detect a request for a search and an advertisement selector to present one or more video advertisements to a user according to characteristics associated with the search. A method and system to preview video content. The system comprises an access component to receive a search request and a loader to simultaneously stream a plurality of videos associated with the search request. The system may further comprise a trigger to detect a pointer positioned over a first video and a mode selector to provide the first video in a preview mode. A method for determining if a set of images in a large collection of images are near duplicates is described. The method includes processing the set of images, generating an image signature for each image in the set of images, and comparing the generated image signatures. The method can be used in clustering and ranking of images. They sound interesting to me, too. I do like their focus on providing timely information. I looked at search results for “Bruce Springsteen” in Google, Yahoo, and Ask, to see how current the information was from each. All three had fairly up-to-date news information. 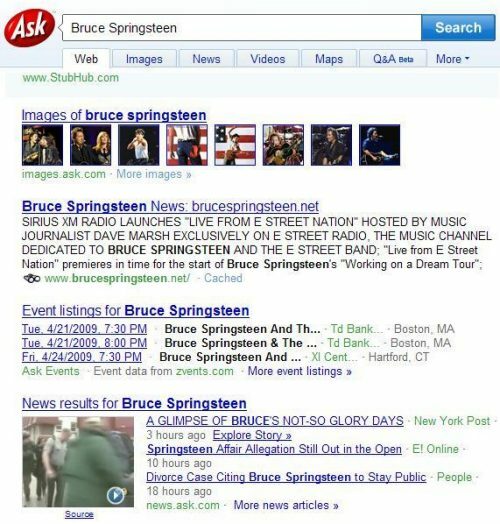 Ask actually had a richer results set than the other two in terms of the images that they displayed, and their listing of future “events” or concerts for Springsteen. Ask.com is a search engine that I hardly ever use and get very little natural search traffic from. However, they have maintained a respectable rank on Alexa.com. These improvements to the Ask.com search engine sound interesting. Thanks for mentioning his return. I wasn’t sure if I should have brought Jeeves into the post originally, but it seemed reasonable since his leaving seemed to be part of a change of direction for Ask. 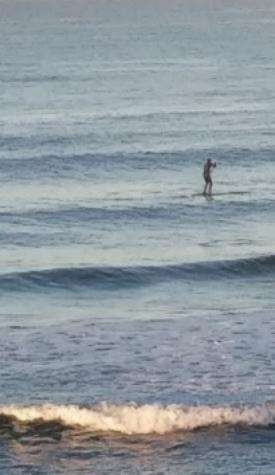 I was surprised to see his return. I’m wondering if he should come back in the US and elsewhere as well. Where Will the Swine Flu Go Next? How Fast Could a Swine Flu Vaccine Be Produced? Is Swine Flu A Worldwide Threat? I look at the headlines in my print newspaper some days, and ask myself if what is being reported really only happened yesterday. Thanks for showing us some examples of how fresh search results are becoming, and how ask.com provides some very relevant and timely links to searches for other related people in the “also in the news” at the top of the results. I really like that feature. Thanks for the heads up, Antonio. I remember when these were published as patent applications, and thinking that the ideas behind them were pretty interesting.